*Number of deaths of infants under one year old per 1,000 live births. Source: CICH graphic created using data adapted from Canadian Institute of Health Information. Trends in Income-Related Health Inequalities in Canada. 2016.
https://secure.cihi.ca/free_products/trends_in_income_related_inequalities_in_canada_2015_en.pdf -accessed June 21, 2017. 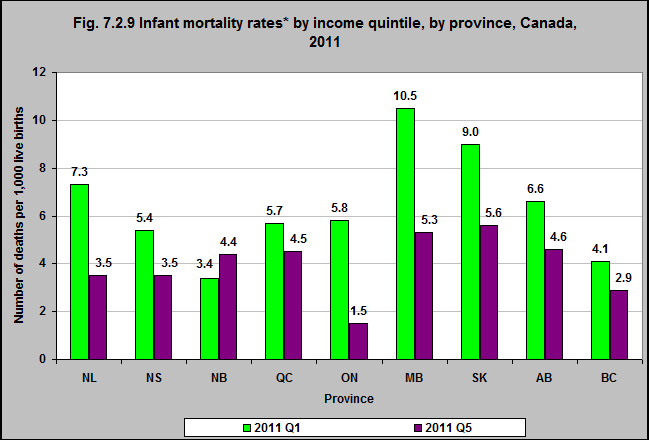 The infant death rate by income quintile varies between the provinces. In Newfoundland & Labrador, in 2011, infants in the lowest income quintile (1) had death rates 2.1 times those of infants in the highest (5) income quintile. In Manitoba infants living in the lowest income neighbourhoods had death rates 2 times that of those in the highest income neighbourhoods. That ratio was 0.8 in New Brunswick and 1.3 in Québec.